Baggybear, what soak off gel do you use for these? Cuccio clear pronto soak off gel. Doing my first one this week looking forward to it!!!! Good idea regarding the soak off gels! All my crystals will arrive tomorrow all 2,500 of them!! I am due to place another order with scattercrystals.co.uk for coloured crystals, will need another couple of hundred of each colour I stock and last time I got factory packs of the clear swaroski crystals and each of those contain 1440 crystals. Amazing how so many crystals can come in such a small envelope though lol. 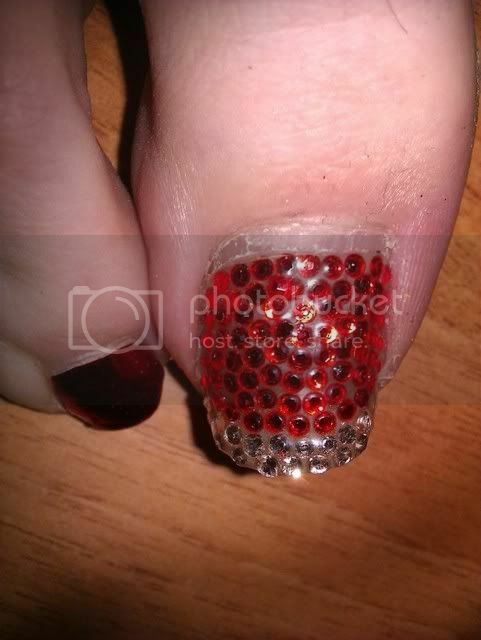 Hope you don't mind me asking but what size do you use for the big toes and then the rest of the toes ,am just about to place my order with Scatter Crystals, ( Fab site by the way thanks for sharing ) and want to make sure I get the right ones. And, on average how many do you find you use on each toe?? can I also ask how much people charge for this? I use ss5 for all toes. The first set in my photo's above were done with ss7 but I thought they looked too big so I ordered ss5 (like the green set above and all sets below) and find these give a better look. I have now bought factory packs of all the colours I use . 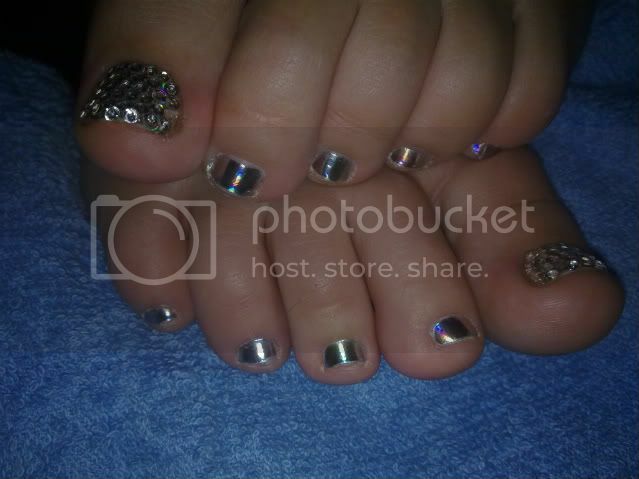 As for how many crystals for each toe that totally depends on how wide the toenail is & how long the toenail is. The green set above took approx 120 crystals for the 2 big toes. So I'd say from 120 upwards for the 2 toes. 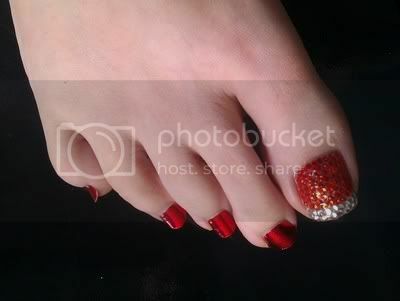 My toes in the red below obviously use more crystals as they are long - I didn't count them though so couldn't say how much more. I charge between £45 & £55. Thanks Baggybear, your nails look fab! I don't know if the clients in my area would pay that amount though so don't know if I will be investing in it at the moment. People in my area are tight with money too but if you sell it propperly you will get work. When people enquire about them I tell them the price but also that it lasts for 4/5 weeks. This then equates to approx £10 a week for those stunning toes. My red set has been on for just over 6 weeks now and I've only lost 1 crystal from the corner of my free edge (becasue I was cleaning under my nails and I absent mindedly picked it off ) this is not noticable to people though just I know it's missing. This is my other toe which I have pushed my cuticle back to show the regrowth - I'm about to take them off and replace them with another design. Wow they look amazing ! Thank you for the info on price's and on the sizes, think i'll go with the ss5's and order a couple of colour's. OOO OOO OOO How excited am I !!! Crystals and Gel Bond all arrived today !!! And funnily enough I have a few guinea pigs already !! 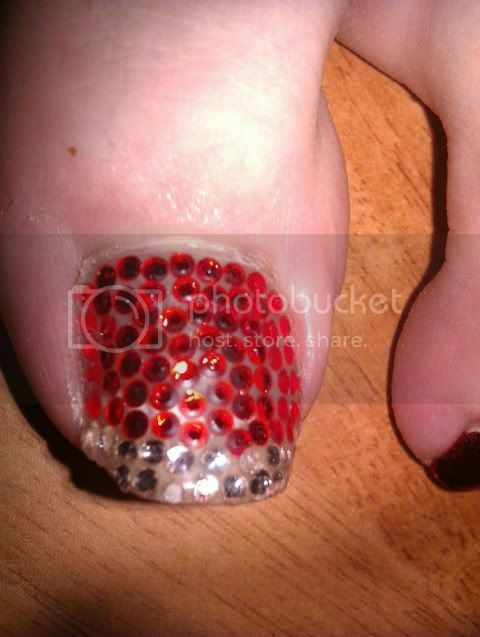 I have just started doing the swarovski toes and having a problem with them lasting!! I did a full set of all ten toes fully covered on Tuesday and some had already popped off on Wednesday,not good!! I had heard of people having them on for 6 weeks etc. Can anyone help me with their procedures? What am I doing wrong?! I cant even get three crystals to stay on the end of my fingertips with Shellac so I'd be interested to read your replies! !